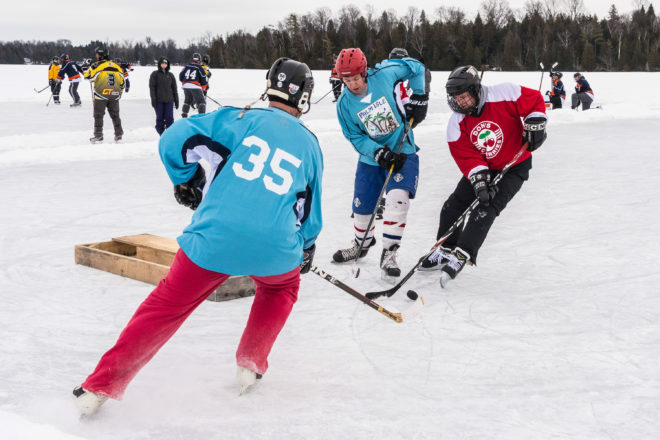 A record 46 teams will participate in the Door County Pond Hockey Tournament Feb. 10. Photo by Len Villano. Forty-six teams will take to the ice on Kangaroo Lake Feb. 10 for the fifth Door County Pond Hockey Tournament. It will be the largest field yet for the tournament organized by the Peninsula Pacers. Teams will play in six divisions on 11 rinks flooded on the ice as they fight for the coveted Stanley Thermos. Spectators are encouraged to join the fun where they can skate on the pleasure rink, enjoy food and beverages served by Door County Rotary North and the Baileys Harbor Community Association, and enjoy beer from Door County Brewing Co. Teams are coming from Chicago, Madison, Milwaukee, the Fox Valley, and Utah to take part this year. Play begins at 8 am, with championship games completing around 3:30 pm. After the tournament there will be live music at Door County Brewing Co. Music Hall and Taproom, plus post-tournament fun at Thyme Cuisine and Cornerstone Pub. Organizers are still seeking scorekeepers to work shifts throughout the day. No hockey knowledge is required, you just have to tally the scores. All scorekeepers will get food, beverages and some sweet Door County Pond Hockey Tournament gear.